Credit Canada's new TV commercial is under fire for being "sexist" and morally offensive. Seriously? Take a look at Credit Canada’s new TV commercial featured below. Even if you've already seen it, give it another look and send comments as to whether you think the advertising is sexist or morally offensive by any reasonable social standards. I've studied it closely for evidence of wrongdoing and I can’t find any flaws. In fact, I think it’s a striking, relevant illustration of the desperation that many Canadians are experiencing today in relation to their finances - they feel like they are drowning in credit card debt and personal loans. They need help with debt problems and our TV commercial makes it clear we're here to lend a hand through trustworthy credit counselling. Unfortunately, the commercial’s intended message appears to have been overshadowed by sexist connotations according to Stacey Leadbetter, an Ontario Green Party Representative from Oshawa. She sees “sexist” and sexually exploitative elements in a TV commercial showing a fully clothed woman struggling underwater before she is rescued from drowning. Specifically, viewers see a woman in jacket, blouse, and skirt twisting and turning in murky water before clasping a hand that reaches into scene to pull her to safety. Leadbetter expressed outrage last week through tweets and email suggesting that the ad’s imagery promotes the victimization of women by favouring a female in jeopardy over a male, and that viewers of the commercial can “almost see up” the film character’s skirt as it coils amid waves of current underwater. Leadbetter further demanded that Credit Canada remove the commercial from the airwaves. At the same time through Twitter, she posted a YouTube link to the commercial and solicited opinions from other social network participants. She said in a tweet that she believed the commercial was “sexist” and asked what other Twitter members thought about the matter. She said every woman she knows finds the ad sexist. Now, this is all quite surprising to me, particularly Ms. Leadbetter’s demand that we remove our commercial from the airwaves. She suggests that imagery in the commercial promotes the victimization of women simply because it features a female in jeopardy over a male. A woman, she suggests, should not have been placed in the role. Really? My comment here is that Credit Canada must attend to its own business. The reason we decided to star a female – who also happens to be an award-winning Canadian athlete in synchronized swimming – is due to the fact that women represent the majority of our clientele. Meanwhile, other ads supporting the TV commercial offer further proof of the total absence of gender discrimination on our part. 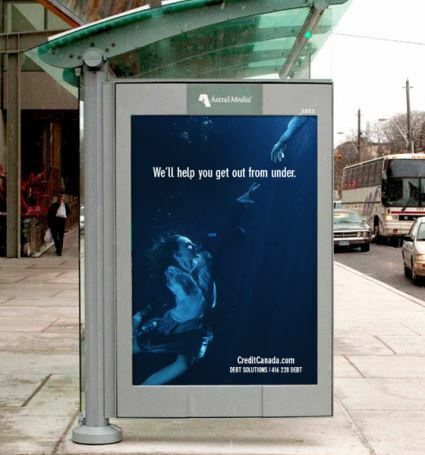 Print ads and transit posters feature an underwater photograph of a male figure in the same dire circumstances as the woman in the TV ad. As to the suggestion that viewers are taking in offensive views from beneath the film character’s skirt as it twirls underwater, let me just say that at no point in the commercial do viewers see the woman’s underclothing. And why shouldn't the film character be wearing a skirt? Her outfit merely reflects the kind of clothing that’s common to the many work-a-day women who come to Credit Canada for help with debt problems. As I see it, the commercial’s net communications take away couldn't be further from issues of gender discrimination. Consider the words that appear onscreen as the commercial’s underwater imagery rolls out and a hand comes in to scene to save the woman from drowning. “Without making a profit or false promises, we've helped over 2 million people since 1966 … We’ll help you get out from under,” say the TV supers. One can safely assume that when you help two million Canadians with debt problems, you’re going to be dealing with large numbers of both women and men. Does Ms. Leadbetter’s criticism amount to overreach? You tell me. Had there been any evidence of sexist or offensive elements in the TV commercial, Credit Canada would have heard from eagle-eyed CRTC regulators who approve TV commercials before they go to air. So far we've received only positive comments about the commercial. It appears to be hitting home in an economy where a good number of Canadians are struggling to stay afloat financially. Let’s hope those with debt problems who see the commercial have the good sense to give us a call.